The alternative packaging takes hold as a mainstream category. 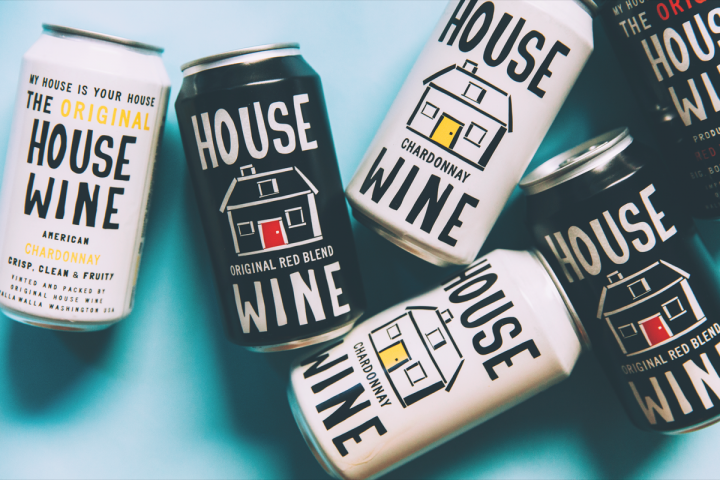 Precept Wines introduced cans for its House Wine brand in 2017. The company expects that 51% of House Wines' depletions will eventually come from its canned business. In Washington, D.C.’s Logan Circle neighborhood, local bar Kingfisher offers a variety of wines, with one caveat: They all come in cans. “Some people are instantly offended that all our wines are in cans,” says general manager Sam Buis. “But most of our guests think it’s awesome. A lot of that comes from the fact that wine in a can is different and unique, and it appeals to people who are a bit more forward-thinking.” Kingfisher’s wine list is currently comprised of nine canned wines, including Infinite Monkey Theorem rosé ($9 an 8-ounce can), Bridge Lane red blend ($12 a 12-ounce can), and Pamp Fizz grapefruit-infused sparkling rosé ($8 an 8-ounce can), among others. Only in recent years have canned wines found placement in on-premise venues like Kingfisher, despite the fact that cans came on stream over a decade ago. California-based The Family Coppola was the first American winery to launch its wine in cans, debuting Minis—187-ml. aluminum cans sold with small straws attached—for its Sofia Blanc de Blancs sparkling wine in 2003. The cans were initially slow to catch on, according to Sofia winemaker Tondi Bolkan, but The Family Coppola persevered with the packaging and has since released a rosé sparkler in cans and introduced 250-ml. cans for its Diamond Collection white wines as well. Since then, the entire canned wine category has taken off. A handful of companies don't even bother with bottles. 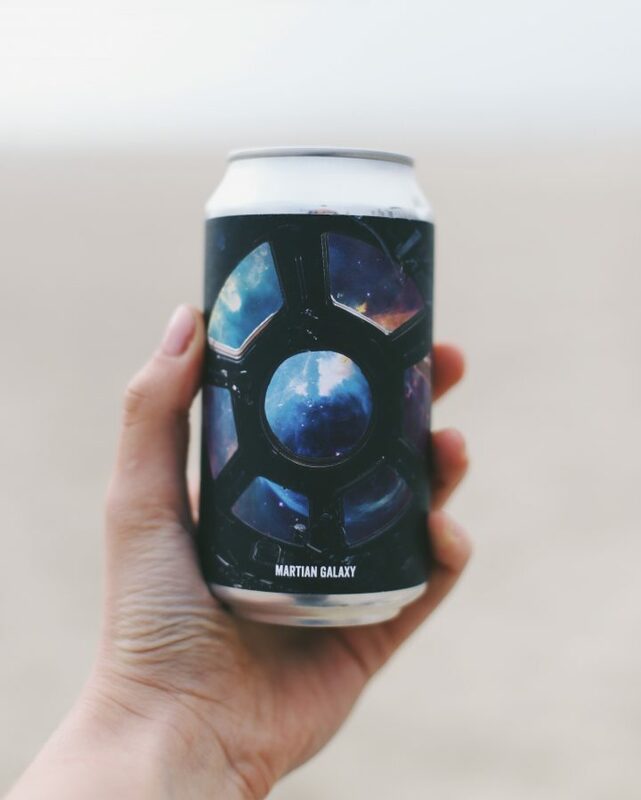 Cleveland, Ohio-based Mancan offers its California-sourced red, white, sparkling white, and rosé wines exclusively in cans. One of the earliest validations of canned wine’s meteoric rise came in 2016, when Nielsen channels reported a 125% increase in canned wine sales during the 52 weeks ending June 18, 2016, bringing the category’s total sales up to $14.5 million. While that’s still a small base, total sales had hovered just below $2 million four years earlier. Last year, canned wine’s dollar growth surged at a rate of 54% in the 52 weeks ending December 30, 2017, the highest of any alternative wine packaging. And today, canned wine is a $28 million industry. Such strong growth can be attributed in part to Oregon’s Union Wine Co., which recaptured consumer interest for canned wine after launching its Underwood label in 375-ml. cans—the equivalent of roughly 2.5 glasses of wine—in 2014. Though the brand’s canned range initially consisted of just Pinot Noir and Pinot Gris, the lineup has since expanded to include canned rosé, white and rosé sparkling wines, a white blend, and wine coolers (all ranging from $6-$7 a can). Today, 55% of the company’s 448,000-case business—which in 2014 was just over 100,000 cases—is in cans. Union Wine Co. founder and owner Ryan Harms credits the success of Underwood’s alternative packaging to its affordability and lack of pretension. “With cans, we embrace the artistry of making great wine, minus all the fuss,” Harms says. “And we’ve remained committed to our original mission of bringing craft quality and affordable Oregon wines to people’s tables for everyday occasions.” Indeed, Underwood’s cans were launched alongside the social media-friendly “Pinkies Down” campaign, which aims to combat the grandiose nature of the wine industry by appealing to millennials and painting wine as an accessible, multi-occasion drink. Ryan Harms, Union Wine Co.
A number of major producers have since followed in Union Wine Co.’s footsteps with canned wine launches of their own. Last spring, Precept Wine’s House Wine label debuted 375-ml. cans for its Red Blend, Chardonnay, and Rosé expressions (all around $6 a can). “We had such great success with the launch of our House Wine 3-liter box that we decided to explore other packaging options for the brand,” says Precept Wine chief sales and marketing officer Alex Evans. “We started looking at cans about two and a half years ago. For me, it’s been the most exciting launch that I’ve ever been a part of.” Hal Landvoigt, Precept Wine’s director of winemaking and winemaker for House Wine, shares this enthusiasm for the brand’s new packaging. “Cans are such a great extension of having wine available, but in a smaller format that’s lighter and easier to pack around,” Landvoigt says. “Canned wine is great for places where, previously, you either didn’t have wine at all, or there was only beer available.” House Wine, which depleted 269,000 cases across all formats in 2017, is currently rolling out canned Sauvignon Blanc and Pinot Noir, and plans to release a limited-edition sparkling rosé in a can later this spring. By the end of this year, Evans estimates that 51% of overall depletions for the brand will come from its canned business. Winesellers Ltd. also jumped into the wine-in-a-can category last year with its organic Italian brand, Tiamo. Alternative packaging had long been a part of the brand’s identity—it was among the first to launch in kegs—so cans were a welcome extension of that narrative. “Putting Tiamo into a can was a natural fit for us,” says Winesellers Ltd. vice president Jordan Sager. “We noticed that the canned wine category already lacked organic wines, so it made sense as a way to differentiate Tiamo from the rest of the pack.” Though cans represent just 7% of Tiamo’s overall mix, Sager expects that number will grow into the double digits in the future. The brand’s canned lineup includes red, white, and rosé wines, with rosé comprising roughly half of the 3,500-case canned production. Like Winesellers Ltd., Graham Veysey and Fisk Biggar also capitalized on an untapped market within the canned category. 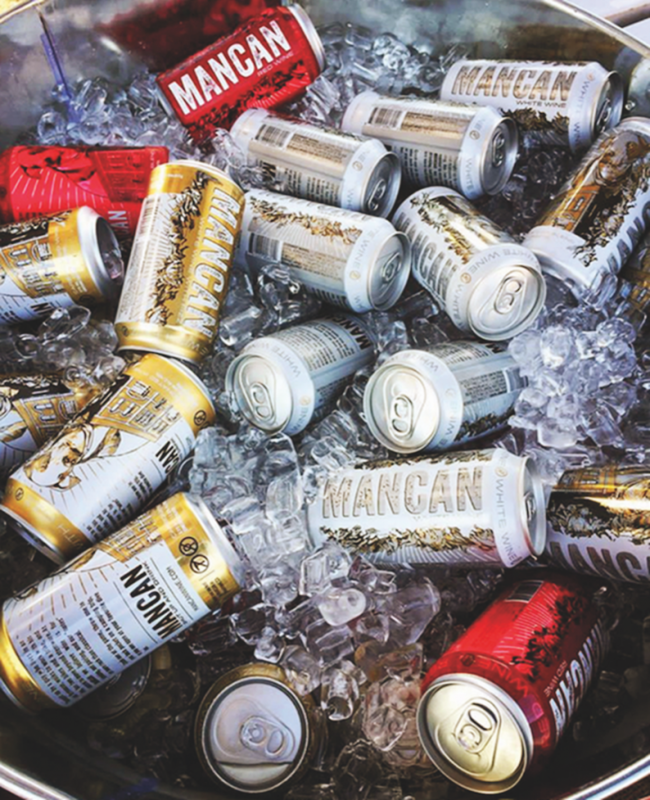 In 2015, the Cleveland, Ohio-based pair created the California-sourced Mancan, one of the few brands on the market that has a can-exclusive portfolio. “Our goal is to be the brand that’s synonymous with wine in a can,” Veysey says. “There’s a competitive advantage of being hyper-focused on wine in a can, and not necessarily competing with ourselves against a bottled product. We’re seeing that in our sales data—we’re pulling at a higher rate because of that focus.” Indeed, Veysey reports that Mancan grew by 125% in 2017. The brand’s lineup includes non-vintage and non-varietal red, white, and lightly sparkling white wines (all $5 a 375-ml.). A rosé debuted on Valentine’s Day. 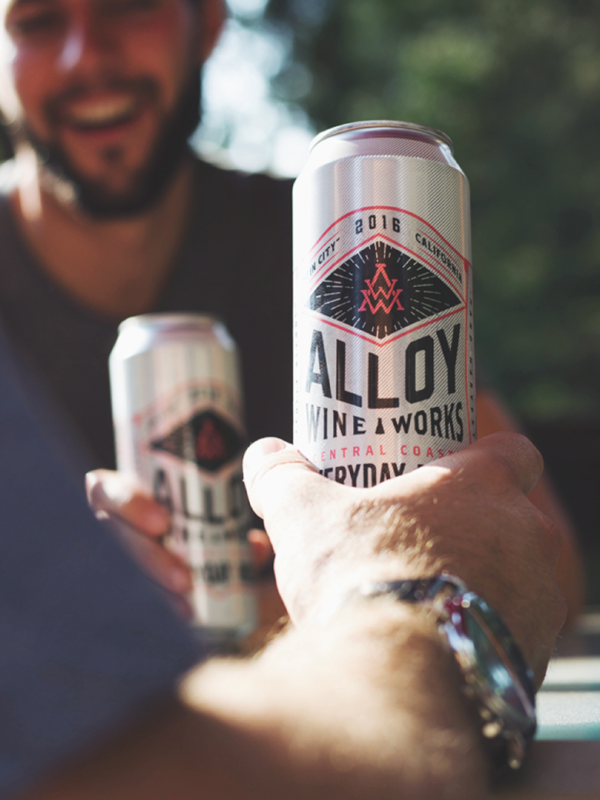 Some canned wine producers, like California's Alloy Wine Works (Everyday Rosé pictured), have started to produce such unique offerings as dry-hopped wines. It’s not just the big players who’ve had success with canned wine; many boutique brands are also contributing to its soaring popularity, and even premiumizing the category in the process. Evan Frazier, an assistant winemaker and general manager at Napa Valley’s famed Kongsgaard Winery, introduced cans for his own label, Ferdinand, last summer. “When I started Ferdinand, I had the idea that it would be fun to make something that’s handmade and in the same spirit of what we do at Kongsgaard—very natural winemaking, but smaller production,” Frazier says. “Going into cans was a natural continuation of that. There was an opportunity to make artisanal wines and then put that juice into a can.” Frazier produced 250 cases of his Ferdinand Albariño—priced at $9 a 375-ml. can—in the first run, which was soon followed by another 250 cases due to skyrocketing demand. About half of the wine he makes for Ferdinand is now offered in cans, and the lineup will eventually include a rosé of Tempranillo as well. At Field Recordings in Paso Robles, California, founder and owner Andrew Jones has been innovating within the canned wine category for several years. After establishing Field Recordings in 2007, Jones released his first canned wine, Fiction Red, in 2014. Though Jones initially conceived the cans as a one-off release, the positive response to the alternative packaging prompted him to continue investing in the format; today, around 40% of Field Recordings’ production is in canned wine under the Alloy Wine Works moniker. Alloy’s lineup consists of three core wines—Chardonnay, Pinot Noir, and Everyday Rosé ($6-$7 a 375-ml. )—and the brand frequently releases unorthodox, limited-edition offerings, mainly for the winery’s can wine club members, though they sometimes become permanent additions to the portfolio. Canned craft wines are becoming an important part of Maryland’s Old Westminster Winery, which puts out high-end, natural expressions. The winery released a pilot run of canned wine in November 2017 that included Carbonic, a Cabernet Franc made with carbonic maceration; Farmer Fizz, a sparkling Chardonnay; and Seeds & Skins, a skin-fermented Pinot Gris. All three wines were fermented with wild yeast and canned without fining or filtering. Old Westminster co-owner and vigneron Drew Baker—who runs the winery with his sisters, Ashli Johnson and Lisa Hinton—acknowledges that while they’re certainly not the first to put wine into cans, their natural wine niche has opened up a new avenue for the category. “We didn’t find much of what already existed in the canned wine space particularly interesting,” Baker says. “So what we did was take the exact same product that’s true to our regional, no-makeup wine philosophy, and put it into a mobile package. Our first 500-case run sold out in a month, so we said ‘Okay, we need to keep going, there’s definitely something here.’” Old Westminster plans to produce around 2,000 cases of canned wine in 2018 in seasonal installments of wholly new and unique wines. 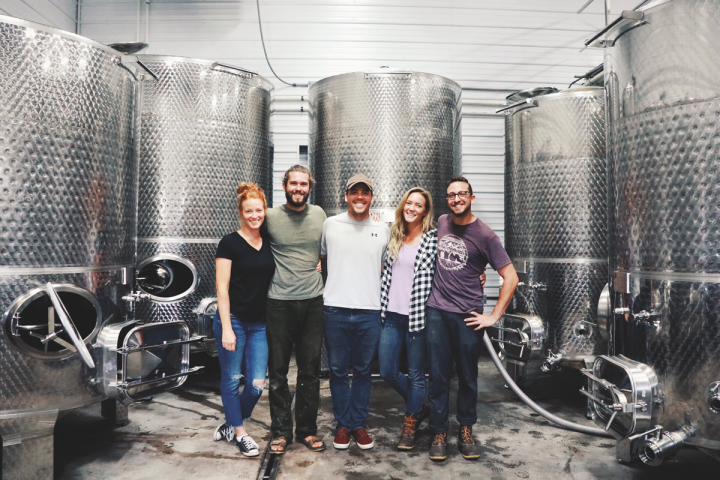 Old Westminster Winery (estate director Ashli Johnson, winemaking assistant Ian Mansfield, co-owner Drew Baker, head winemaker Lisa Hinton, and winemaking assistant Joey Fox pictured) started canning its natural, high-end wines last year. The advent of wine in cans has not come without stumbling blocks. Seasonality, quality perception, and pricing are sources of uncertainty for a number of producers, both big and small. “Baby boomers seem to frown upon the category, and think it’s only for low-quality wines,” Winesellers’ Sager observes. “It’s also a highly seasonal category, especially for retail sales. Getting the market demand in the winter months is a major challenge, as cans are really driven on spring and summer sales.” Sales volume for Tiamo’s cans slowed noticeably after the warmer months ended, according to Sager, though the company hopes to break the seasonal sales patterns as canned wine becomes more mainstream. At Old Westminster, where cans of wine are priced at $10 a 375-ml., Baker sees issues not with pricing so much as popular perception. “I’d say we’re having challenges with the category’s perceived value, rather than pricing—consumers are conditioned to think that beverages in cans are inexpensive,” Baker says. “For us, we’re taking a product that has a high fixed cost that we would otherwise put into a bottle and sell for $30. Now we’re trying to make sense of that in cans, and that appears to be a can of wine at $10. But in the consumer’s mind, the question is whether that’s for four cans or six. And then you have to explain that it’s the price per can.” Old Westminster has thus far combatted quality perception with tastings, though Baker says retail sales add another layer to the problem, as shelf space is crowded with cans that are overwhelmingly priced at $10-and-under a 4-pack. Seasonality, quality perception, and pricing are sources of uncertainty for a number of producers, both big and small. Whole Foods Market global wine buyer Doug Bell has likewise noted potential problems with the proliferation of canned wine. “The biggest challenge for us over the next 12 months is that we’re going to see so many new canned wine brands come out, there’s not going to be enough room on the shelf,” he says. “And we haven’t even had an extremely large producer, like E. & J. Gallo or Constellation Brands, come to the table with a branded can yet. It hasn’t happened, and it’s going to change the industry.” Though the retailer’s canned wine offerings differ by market, canned SKUs are currently available within 350 licensed Whole Foods locations across 62 metro areas. As the category continues growing, Bell expects Whole Foods’ canned wine options will adjust accordingly. Alloy Wine Works (Martian Galaxy dry-hopped rosé pictured) has diversified the entire wine category with numerous experimental releases. 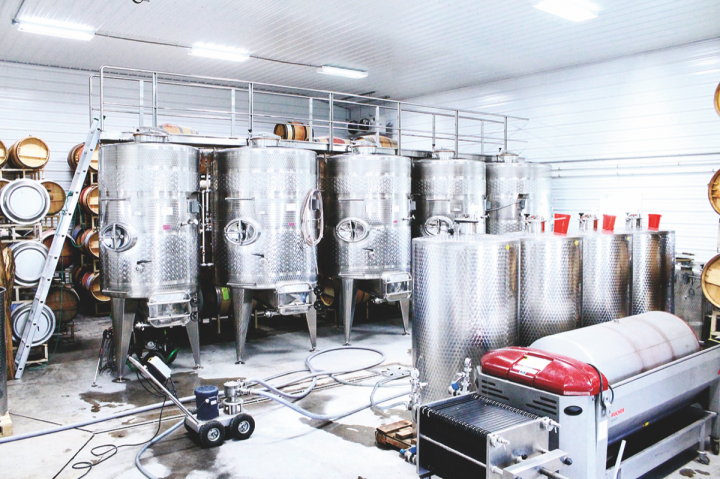 At Old Westminster (fermenters pictured), co-owner Drew Baker is bullish on canned wine's prospects. Union Wine Co. is betting big on this momentum within the category. Last year, the winery broke ground on a new packaging facility set to significantly increase its capacity. “The category has been expanding steadily every year, and it will continue to mature, as we are already seeing new brands enter—it confirms that canned wine isn’t just a trend, but truly a new category of packaging in the wine business,” Harms says. “By building this new facility, we’re setting ourselves up to continue growing with it.” The new, 43,000-square-foot outpost will be able to produce 600-650 cans a minute at full capacity, as well as 200-250 bottles. At Old Westminster, Baker is likewise bullish on the category’s prospects. “The canned wine category is going to explode,” Baker says. “I’ve always thought that it’s crazy that when you walk into the average liquor store, there might be 10,000 SKUs of wine on the wall, and about 99% of them are packaged the exact same way: in 750-ml. glass, with cork or a synthetic lookalike and a label. There are very few consumer products out there that have so much selection, yet so little diversity. And historically, it’s because it was brand suicide to do anything nontraditional, because it’s perceived as cheap. But I feel like the market is primed to accept that even though it’s in a can, it’s really amazing wine. The can is simply a medium.